As spring matches on, high growth becomes evident with undergrowth thickening, and ponds suddenly become lost from view. You can expect to go into a war with shrubbery and grass, and it is a war that you are unlikely to win without the proper equipment. Homeowners need to clear the overgrowth for aesthetic reasons, but it is the commercial operators, especially landscapers and farmers who have a greater need to clear undergrowth. Often, the first pick when considering a tool to clear shrubbery and grass is the four-wheel rotary mower. They are an excellent pick given that the vegetation isn’t too thick, but even the best machines are overwhelmed by dense vegetation or uneven terrain. Moreover, these mowers cannot access all the areas that undergrowth penetrates. A brush cutter, on the other hand, comes into its own is such situations. Given that it is light and thus you can use for long hours, small to get into tight spots, and maneuverable for any terrain, it is an indispensable tool for any gardener. Nevertheless, a cheap, low-powered machine will not cut it, and you need to get a powerful apparatus. Below is a guide and some recommendations to help you make an informed decision. If you reside near a plot, and you are tasked with its maintenance, you inevitably have to clear some of the tall weeds, lest you attract insects and pests on to your property. We recommend the Remington RM2700 brush cutter as it is designed with such applications in mind. First, this is a 2-cycle/stroke unit and thus lighter. Nevertheless, it is a 27cc unit and thus packs enough power for tough weeds. Moreover, the 8,000 RPM ensures that the device can eat through any brush and weeds. Included in the set are a bump head, a brushcutter, and 2-cycle oil. Another fascinating feature of this unit is that its attachment ready in that you can convert it into a blower, an edger or a cultivator. As for safety you need not worry of rocks ricocheting and hitting you as the set includes some guards. Ergonomics – Seeing as this is a gas tool, you can expect it to be bulky. However, this unit is an exception to this rule as it weighs 9.9 pounds and lighter than most electric options. Furthermore, it features a double harness for better weight distribution on your shoulders. Finally, it incorporates padded bicycle handlebars for better control and comfort. Smart start engine – If you have ever worked with a gas brushcutter, you understand how it takes more than one pull to start the engine. The Remington though makes it a breeze with the Smart Start tech that removes all air from the carburetor and engine for fast ignition. Furthermore, the stop switch returns to its home position so that it will be easier to turn the cutter on. Given that it is a 2-cycle piece of equipment we recommend it for medium undergrowth. Price is relative, as what is pricey for you can be cheap to another. However, the Husqvarna is a bit costly, and we recommend it for homeowners who price isn’t a concern. Nonetheless, it is a solid, especially for heavy-duty tasks. First, it features a 1.1HP, 25cc engine with a 6,600 torque power and 9,000 max power speed. The unit weighs 9.9 pounds, but that is before the attachments and the fuel, which is about 17 ounces. Another fascinating feature about this unit is that it’s ergonomically designed with standard double harnesses to distribute the weight, and features angled handlebars for better control and comfort. Also, you can swap the blade for a bumper head to trim grass and weeds. The grass bevel gear gives you high torque and ensures the cutting equipment is parallel to the ground for top cutting performance. Cutting path – With a 17-inch cutting path, you can clear large areas in less time. However, it still allows you to get close and into hard to reach areas for better results. Air purge system – Starting a gas-powered engine is a bit difficult as you need to pull the rope twice or more before the engine can run. However, the air purge system removes air from the engine and carburetor for better ignition. Couple this with the smart start and you will start the unit with minimum effort. Fuel capacity: 16.91 fl oz. We recommend this unit for people who are not on a budget and have large lawns. If you are looking for a fuel efficient but powerful engine, we recommend you consider the Makita EM2650UH. This is an MM4 (managed mini 4) stroke engine, and thus there is no mixing of oil and gas. Some fascinating aspects of this tool include the mechanical automatic decompression engine and the heavy duty dual stage filter. The former makes it easier and quicker to start the engine by getting rid of the air in the carburetor and engine, while the former leads to longer life. Nevertheless, the large sealing areas in the filter are replaceable, and the apparatus allows for tool-less filter access, and thus they are easily accessible. As for the performance, you will never lack in power thanks to the 1.1hp, 25.4cc engine. Moreover, this is a 4-stroke engine and packs quite a punch. You will also love how light this appliance is as it weighs 12.1 pounds. It also includes a harness with shoulder straps and a waist belt to distribute this weight evenly. The bicycle/horn handlebars, on the other hand, result in more maneuverability, better gripping, and better balance. Another fascinating feature is that the unit features a steel drive shaft lowering the vibration. Consequently, you can expect longer equipment life and better user experience. Multi-position lubrication – When working on rugged terrain, there are instances where you have to incline the tool. The multi-position lubrication, allows you to bend the tool at an angle and for long periods of time. Oil level view window – It makes checking the oil and replacing it a walk in the park. We recommend it for homeowners with more demanding tasks or tough overgrowth. If you are in the market for a tool that can double both in commercial and residential use, we recommend you get the 52cc heavy-duty unit from Timberpro. The power and the versatility are impressive but more on this later. First, it has a large 700mm tank allowing you to work for long hours without having to refill. Moreover, it weighs a mere 13 pounds which is light for a commercial grade unit. However, this is before the attachments and the fuel. Another fascinating feature is the easy starting system, as it gets rid of the need for two or more pulls to get it running. As for comfort, the tool features a shoulder strap harness and is easy to handle thank to the bicycle handlebar design. Power – Should you decide to purchase the Timberpro 52cc unit, you can rest assured to never lack in power. With a 52cc displacement a 3hp motor, it will cut through brush like a knife through butter. Versatility – The Timberpro heavy duty clearing saw is resourceful thanks to its versatility. First, it retails with three blades for various applications; a 3-tooth, 8-tooth, and 40-tooth blade to handle the toughest jobs. Moreover, it accepts attachments, and you can use it as a trimmer with the included bump head. This is great for both professional and residential uses. 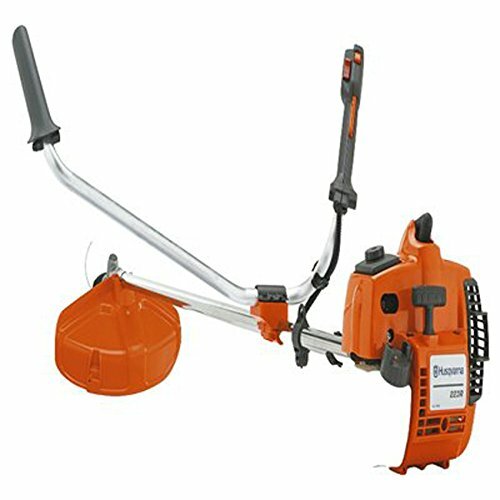 Moreover, if you are in the market for a tool that can dub as a trimmer and brushcutter, we suggest you pick the Timberpro 52cc. With an 8” cutting width you can expect to get up and close to flowers or trees without damaging them. Couple this compact blade design with the straight shaft, and you can expect to get into tight spaces with ease. Moreover, the unit isn’t lacking in power thanks to the 27cc 2-cycle engine. 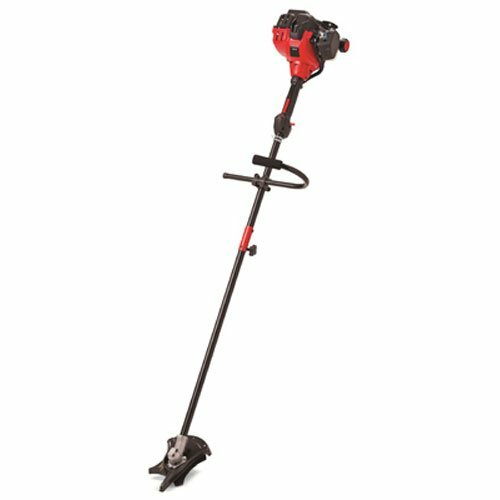 You can power through any brush and weeds with this unit. You will also appreciate the ergonomics as this brush cutter features a j-handle for better control and it is ideal for right and left-handed use. Another fascinating aspect about this unit was quality-build; the steel-tip blade that allows you to cut the toughest overgrowth and is long-lasting. Our best features though were the jumpstart capability and the versatility. Versatility – The TB42 is designed to be resourceful. First, the set includes a bumper head for trimming. The unit also happens to be attachment enabled allowing you to work with about 10 TrimmerPlus attachment tools. Finally, you can attach the blade in a vertical or horizontal position for ground and overhead applications. Jumpstart capability – Though it is easy to start, the jumpstart capability gives it an edge over other comparable tools as you can start the machine without having to pull the cord. The Troy-Bilt is for residential and farm use. However, we recommend it for people with TrimmerPlus attachment tools owing to the versatility. If you are looking for a powerful, comfortable, stable machine, and the price isn’t your top concern, we recommend you try the Echo SRM-410U. This tool is for heavy-duty tasks, and you can expect it to last. 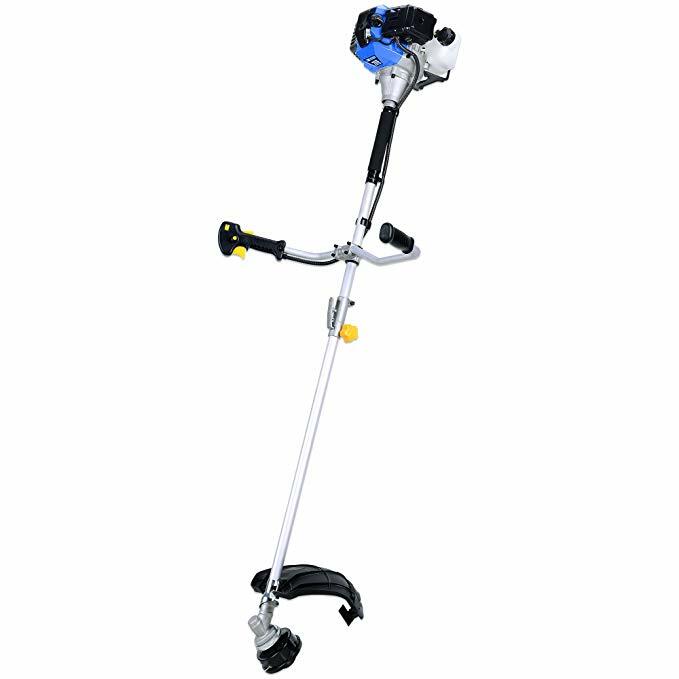 The SRM-410U is a bit bulky at 18 pounds, but this shouldn’t be a problem for professional landscapers and is a worthwhile tradeoff given the quality of the unit. The brush saw features a 10”, 80-tooth blade that makes quick work of any weeds or brush. It also allows you to get into close to trees without damaging the back, while the 60.2” steel drive shaft that enables you to reach into tight spots especially between trees and crops. Another fascinating aspect about this unit is the power given that it features a 42.7 cc power boost engine. Furthermore, unlike other brush saws that feature flimsy plastic guards, you can expect to be safer with the Echo tool as it features a metallic guard. The air filtration also happens to be top of the line as it is commercial grade, and the gear case is metallic, heavy-duty, with sealed bearing. Muffler – When working in a residential area, you want a unit with low-noise levels, and the SRM-410U is that tool thanks to a spark-arresting low-tone muffler. Centrifugal clutch – For safety reasons and fuel efficiency the centrifugal clutch keeps the head from spinning any time it is idling and when starting. 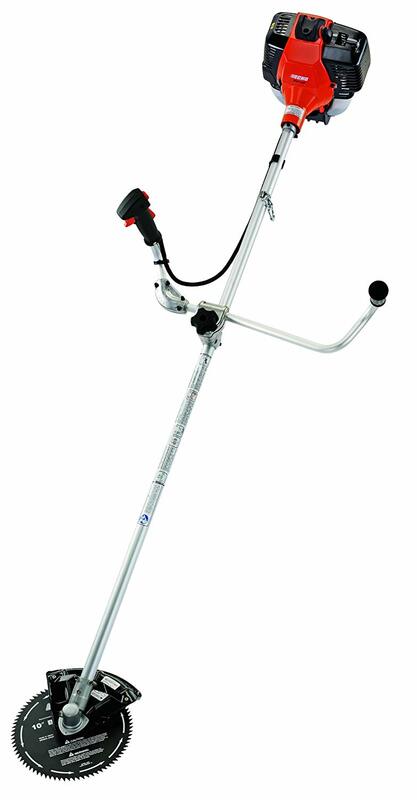 We recommend the Echo SRM-410U for professional landscapers and farmers. It is especially ideal when dealing with thick brush. If you are in the market for a versatile OPTION, consider getting the 36FR. This tool doubles as a string trimmer and saw blade. It is designed to be comfortable and with the user's health in mind but more on this later. First, this tool features a bevel gear with high torque and one that keeps the blade parallel to the ground for enhanced performance. You will also appreciate the choke and purge that makes the engine easy to start by getting rid of air from the carburetor and engine. Furthermore, there is a smart start that allows it to start effortlessly. You will also appreciate the quality of this tool. Starting with the commercial grade air filter will lower the cost of service and reduce the wear and tear, to the chromium plated cylinder bore which increases durability, you can tell this tool is built to last. But now to our top features. Ergonomics – for comfort, IT features a balance 35 harness that distributes the weight to your shoulders. Moreover, the U-shaped handle increases the maneuverability of the unit and happens to be adjustable. X-Torq engine – Thanks to the X-torq efficiency, you can expect to use 20% less fuel than any comparable unit. Moreover, it is eco-friendly and a healthier tool as it lowers harmful emissions by close to 60%. We recommend this unit for homeowners looking for the flexibility of being able to use all three tools. Furthermore, it is great for large lawns and heavy-duty work. If you are looking for a powerful but affordable option, you might want to get the Blue Max 52623. First, this unit weighs 21.6 pounds and thus the heaviest on this guide. 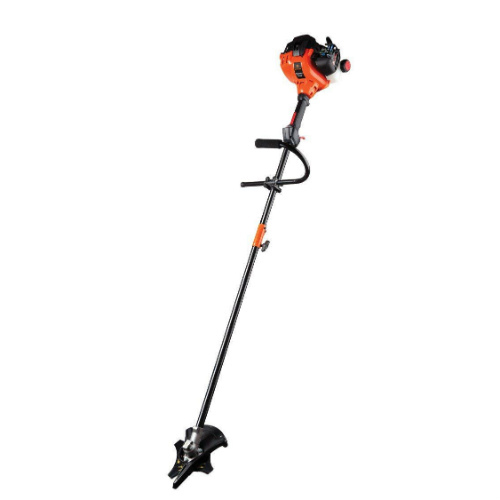 It features a straight shaft that enables it to get into tight spots and has a 15-inch, 3-tooth cutting blade to get close to edges and trees. The EZ start recoil system is guaranteed to perform exceptionally making it easy to start the unit. Furthermore, you will love the large guard that keeps you safe from rocks and sticks ricocheting from the blade. Another fascinating feature is how fuel-efficient it is for such a heavy-duty tool. Our top features though were the power and the anti-vibration. Power – With a 2-stroke engine, you can expect top performance from this unit. The big motor, a sharp blade, a long reach, and the fuel tank will make short work of any clearance job. Anti-vibration – With a 42.6cc motor, the vibration is more than one bargained for. However, the anti-vibration features lower this. Seeing as the Blue Max is a massive tool, we recommend it for clearing large areas. Moreover, it is excellent for people who want the flexibility of a trimmer and brush saw in one device. For people with smaller lawns, we recommend you get the electric motor Ryobi RBC1020 device. Ryobi remains an ideal brand for homeowners considering the price point, but this unit happens to be a reliable tool. First, this is a 2-in-1 tool that doubles up as a trimmer, and thus you will appreciate the versatility. Moreover, the Tri-arc blade and Tri-arc bumper head will last, and the blade especially is designed to withstand abuse and provides better cutting performance. Moreover, with a 7-inch cutting width, you can expect to get into tight spots with ease. Our best features though were the electric motor and the ergonomics. 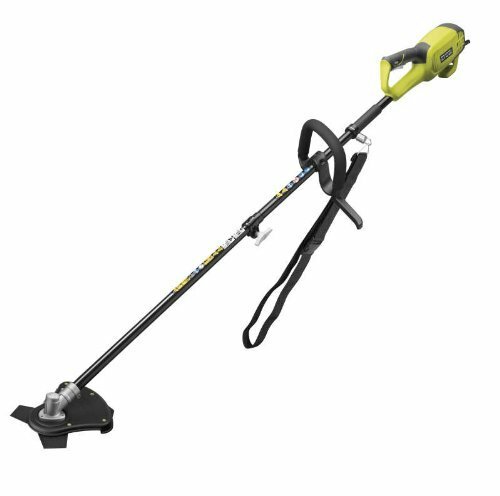 Electric motor – The 1000w Ryobi electric motor will make quick work of any tough weeds. Moreover, it has lower vibrations, it is quiet, and overall quite pleasant to use. Ergonomics – The RBC1020 is designed to be cozy and pleasant to work with, and at about 7 pounds, it is quite lightweight. Thus you can expect to use it for longer periods without fatigue. Moreover, being an electric unit, it has lower vibrations than gas-powered counterparts. You will also appreciate the height- adjustable handle as it allows you to get a custom fit and it also features a soft grip design for comfort and better control. Included is a pair of shoulder straps that distribute weight evenly across your shoulders. Seeing as this is a corded unit, we recommend it for individuals with small yards. Moreover, it is the perfect pick for eco-friendly homeowners. If price is not that much of a concern, and you are in the market for an option that can handle both light and heavy-duty tasks, we recommend you get this 52cc unit. First, it weighs about 28 pounds and is a 52 cc unit and thus we wouldn’t recommend it for just anyone. Included in the set are some shoulder straps to distribute the weight evenly, but we suggest you get a premium harness for better comfort. Nevertheless, at 52cc, this tool will make short work of any lawn-clearing task. Moreover, it is versatile but more on that shortly. Being a gas-powered unit, we recommend it for commercial uses and clearing large areas. Farmers especially will love this unit. Finally, it features a u-handle for better control. Our best feature though was the versatility. Versatility - First, this unit is designed to be compatible. It features a split shaft where you can attach other accessories which also helps in storage and transportation. This tool can be a trimmer with the included bump head, and as a brushcutter with the two blades included (3T blade and 40T blade). 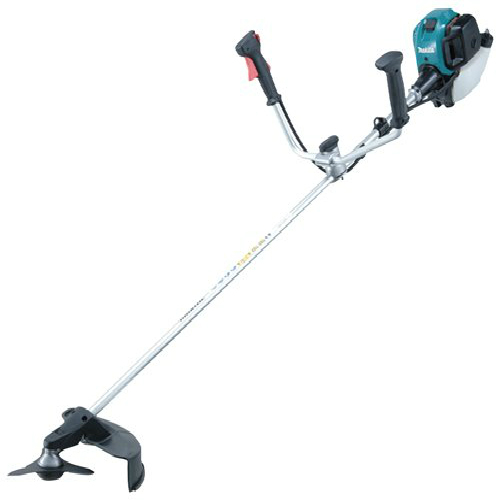 You can expand it to be a hedge trimmer, lawn mower, or even a pole saw. Given the weight, we recommend it for men, and professionals as it is a pricey unit. Though these two seem similar, and the terms are used interchangeably, there are some dissimilarities. String trimmers use a cord and are only ideal for cutting light brush and weed. The wire spins at a high rate slicing through the weeds or grass at the height at which you’re holding it. However, it cannot handle woody stalks or dried brush as it tends to be less powerful. Clearing saws, on the other hand, are exceptional as they gnaw through heavier material effortlessly. Nevertheless, they are not for yard maintenance but rather dealing with overgrown areas. Below are some features to consider when purchasing a brush saw. You can get an electric or gas brush cutter. Gas clearing saws tend to be more mobile and the best pick for large lawns. Moreover, they are more powerful and the best option when dealing with dense undergrowth and dead weeds. However, they are bulkier, challenging to use, and require regular maintenance. Electric units, on the other hand, are eco-friendly and quiet. Maintaining them is a walk in the park, and they are pleasant to use. However, they use battery packs and thus have limited runtimes, or need a power outlet, and therefore the reach is limited. You can employ an extension cord, but it still won’t be enough for a larger yard. When working with an electric brush cutter, you can get a 20 volt, a 40 volt, and occasionally a 60 volt or 80-volt A 20-volt tool is excellent for small to medium yards, while 40, 60, and 80-volt units are perfect for more substantial material. When purchasing a gas tool, you can expect a 2-stroke or 4-stroke engine. A 2-stroke engine is easy to maintain, and although it is smaller, it has more balance, while a 4-stroke engine which is bulkier but more robust for those demanding tasks. Moreover, it runs cooler and thus the best pick for extended operations, but it is unbalanced and tends to cost more. They feature either a bent shaft or a straight shaft (the shaft is the part that connects the head to the motor). If you want to get closer to the work area, we recommend a bent shaft but expect more mechanical issues owing to the design. Alternatively, you can invest in a straight shaft as it works better with attachments and there is a direct line to the power source. When investing in such a pricey tool, consider the blades available with the unit and the cost of replacement. As this is a powerful tool, we recommend you invest in a unit with good handholds for better control. A unit, “bike handle,” or a looped handle are the two best options owing to the better control. As for vibration, we recommend a brush cutter with anti-vibration technology, and padded handles to save you from the numbing motion. I need to trim my yard and clear weeds. Do I need two tools for this? 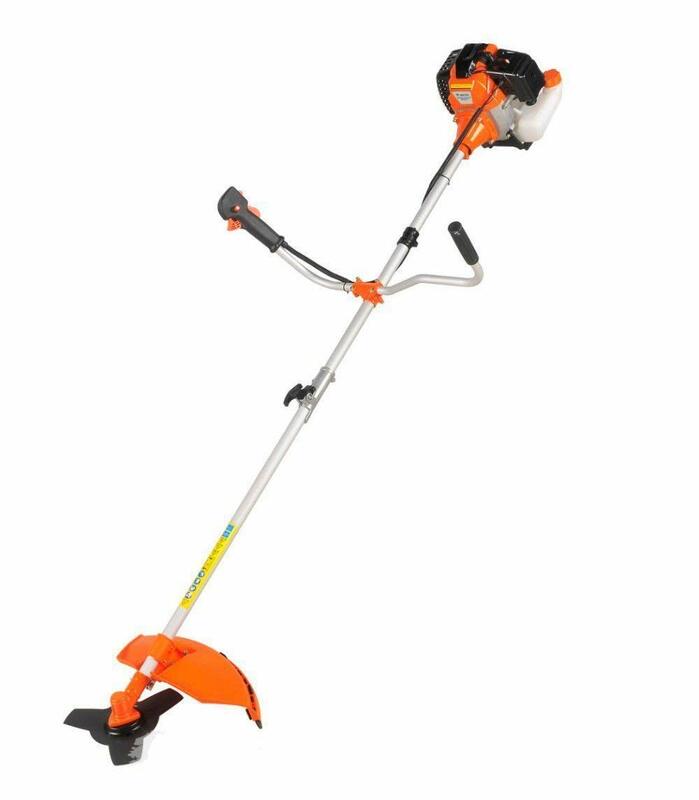 Should you decide to pick dedicated tools, you will need a string trimmer which is excellent for garden maintenance and a brush saw which are designed to handle tough weeds but aren’t ideal for garden maintenance. However, we recommend you get a combination tool to save yourself the hassle and a ton of money. Most of the instruments on this guide double up as trimmers for grass and yard maintenance. How can one tell if a brush cutter is quiet? Most homeowners need a quiet tool unlike professionals and farmers whose work is away from residential areas and thus can get away with loud machines. You will have to check the cutters specifications for the noise level, but here are some few tips. You can purchase an electric tool such as the Ryobi RBC1020, as they are quieter, or opt for a 4-stroke unit if you still prefer a gas-powered machine. This is relative to the person and how powerful the tool is. Most commercial grade units are demanding owing to the vibration and powerful motor. We only recommend this to people who have prior experience working with the brush cutters. Moreover, they are bulky and thus demanding. However, most consumer brush cutters are easy to use. They are lightweight, feature ergonomic handles, have an easy learning and are just powerful not to be uncomfortable. Moreover, they include harnesses too to distribute the weight of the tool. Do I need protective equipment when using one? The short answer is yes. Ensure you have safety glasses and a visor, hearing protection as these are loud machines, protective trousers and work boots. Don’t forget to get some quality gloves too. What fuel should I use in a clearing saw? The fuel you use will depend on your brush cutters engine. Most tools use a 2-stroke engine that should always run on a mixture of petrol and quality 2-stroke oil. Check the manufacturer’s manual for the mix details and use a measuring bottle to get the right amounts. As for the 4-stroke engine, brush saw, they only require unleaded petrol to run. How do I safely use a brush cutter? First, ensure you have all the appropriate gear illustrated above. First, read the manual and proceed to ensure that the safety guards and any other safety devices are working correctly. Moreover, ensure that all loose parts are tightened and that the muffler is in remarkable condition. Ensure that people aren’t in the work area, and clear the space of rocks metal, glass, and other debris that might turn into a projectile. When using the tool, ensure you have refueled it first, and wait for the engine to cool down if refueling is needed before the job is completed. Use the tool at ground level only, and switch off the engine before clearing a clogged cutter. Finally, maintain a solid grip, and secure footing whenever you are using the tool. Brush cutters also known as brush saws are great for reaching into areas where a rotary mower cannot access. They are great for uneven terrain and tough weeds that would bog down a four-wheeler. 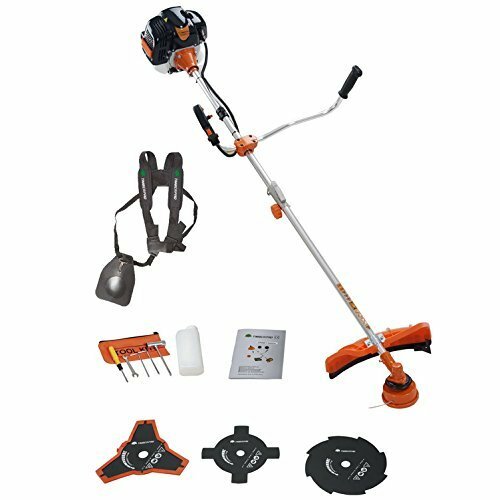 Moreover, with the appropriate accessories, they can be used as string trimmers for garden maintenance. The clearing saws above will make your work a walk in the park. The guide will help people who are new to these tools make an informed decision and can also be used to break a tie. Remember to stick to your budget and only purchase a machine you feel is ideal for you. Finally, don’t forget to leave a comment below on what you think about this article.